The Great Wall is China's best known historical monument. Stretching 1,674 miles [2,694 kms] it has formed China's northern boundary for thousands of years. With impassable mountains forming the border to the west and south-west, and the sea to the east it is the northern boundary that has always posed the main threat to China. In ancient days, the nomadic people of the northern steppes were illiterate; herding grazing animals for a living. Occasionally groups would use their superior horsemanship to advantage by raiding Chinese towns for silk and lacquer-work. Sometimes these raids were large enough to threaten the Chinese Empire. In 166BCE 140,000 horsemen came within 100 miles [161 kms] of the capital Chang'an. In Chinese the Great Wall is called 长城 Chang cheng long fortress or 万里长城 Wan li Chang cheng ten thousand li long fortress although it actually measures 12,000 li (Li is a Chinese unit of distance of 0.5km). The term ‘fortress’ does seem strange for a wall but the Great Wall was always more than just a wall; with watchtowers in clear view of each other, continually manned, there were requirements for food and other supplies for the thousands of people defending it. So it was more like a community strung out in a long line than a bare wall. When defenders spotted an enemy a beacon fire was lit which soon propagated to the next in the chain - by smoke (from burning wolf dung) during the day and by fire at night. The beacons alerted defenders to send out help from the closest fort, similar to what can be seen in the Muster of Rohan in the Lord of The Rings ➚ film. Like other Great Walls around the world, a wall is just as much about keeping people in, as keeping 'barbarians' out. Without a well maintained border people would be free to evade justice and taxes by just crossing the border whenever they wished. It also has a key symbolic role of marking the border so people definitely knew if they were inside or outside China. The wall was not all built at one time, much of what people see at Badaling near Beijing is a modern 1950s and 60s restoration of a Ming dynasty rebuild of an original wall. For many hundred of miles the wall has not been well maintained and is in a state of dilapidation. There are also 'gaps' in the wall, it was never a continuous feature. Far away in the Gobi Desert where stone and wood were not to hand, layers of pounded soil and reeds made an adequate alternative as rain is so rare. So only the easternmost 500 miles [805 kms] from Ningxia looks like the modern image of the Great Wall. 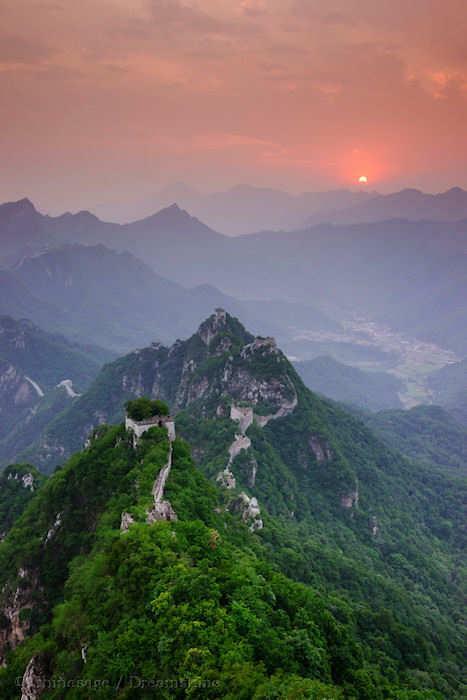 There are a few viewing locations open to vast numbers of tourists along the route including: Badaling ➚ 八达岭; Mutianyu ➚ 慕田峪; Huanghua Cheng ➚; Simatai ➚; and Jinshanling ➚ 金山岭. The chief architect of the Great Wall was Qin Shihuangdi - the First Qin Emperor of China who conquered the kingdoms making up China. One of his many initiatives for nation-building was patching up and linking the various walls that had been built over the preceding centuries. Previously, in the Warring States period, many of the kingdoms had built walls to defend themselves. He ordered General Meng Tian ➚ to use up to 300,000 slaves to build new and strengthen existing walls. About 500 million tons of material make up the wall. For the Qin dynasty and those that followed, the Wall marked the division between the civilized world and the barbarians outside. The ‘Great Wall’ as it is understood today (the brown line on the map) stretches from 山海关 Shanhaiguan on the Yellow Sea (near QinHuangDao, Hebei) all the way to the 嘉峪关 Jiayuguan Jade Gate, Gansu in the depths of the Gobi desert. A plaque at Shanhaiguan proclaims it as 'Tian xia di yi guan' 天下第一关 the First pass under Heaven, identifying it as the edge of the civilized world. The tower at the western end at Jiayuguan, Gansu was built in 1372 on the orders of the first Ming Emperor Zhu Yuanzhang; the walls are 38 feet [12 meters] high and (800 yards [732 meters] long. The story goes that the fort's construction was so carefully planned that only one brick was left over when completed. Many legends are told of the making of the Great Wall evoke the hardship of the hundreds of thousands who were forced into service to build it. The emperor used conscripted labor and many families lost their men to the endeavor. Of particular concern was the burial of the many who died building it, a very strong cultural tradition dictated that the body should be returned to the ancestral burial ground, but most were just interred under the Wall itself. Nu Mengjiang's husband was one such conscript. Nu Mengjiang ➚ went to seek out her husband and after much searching was told he was buried beneath the Wall. After three nights of Nu Mengjiang's sad and lonely vigil, the Wall split open revealing the bodies of the dead including her husband clasping the other half a jade hairpin she carried with her. Heartbroken she threw herself into the sea. A temple at Shanhaiguan commemorates the legend. Photo by Georgio ➚, available under a Creative Commons license ➚. Built to take five horsemen riding abreast with regular watch towers and forts, the Great Wall was designed to impose itself on the landscape. This led to some to hypothesize that it could be seen from the Moon long before space travel. This did not turn out to be true, the Great Wall is only a few yards wide, and features that small can not be seen from such a distance. The suggestion was probably triggered by the apparent discovery of canals on Mars ➚. After the Qin dynasty the succeeding Han extended the wall to the west to defend the new territories they had conquered (the Gansu corridor). Over the next few hundred years the Great Wall served mainly as a border marker and little was done to keep it in good repair. It was only on the reunification of China under the Sui dynasty that the Wall was repaired and strengthened using as many as a million men as laborers. It served its purpose well for many centuries, but when the Mongols invading it kept them out for only a few years (1211-1215). When the Mongol dynasty came to power the wall lost any strategic value as Mongolia and China were united and it began to fall into disrepair again. During the following Ming Dynasty paranoia about possible attacks from the north led to a military expedition northward by Emperor Zhengtong ➚ in 1449. It led to a humiliating defeat brought on by incessant rain and poor leadership. An estimated 500,000 troops took part, and it ended up with the capture of the Emperor himself and the massacre of the Army. This debacle led many to favor a strengthening of the Great Wall to block any further trouble and forget any ideas of conquest north into Mongolia. The new line of the wall did, in places, follow a different line to the original Qin wall. The crippling expense of the wall was a subject of great debate, construction started in 1455 and continued sporadically until the fall of the dynasty in 1644. Rather than the low, earth built walls in the western section the Ming walls were chiefly of stone. At strategic points it was not just a single line of wall but made of two or more parallel walls. The average height was 24 feet [7 meters] and 21 feet [6 meters] thick at the base. The core was filled with earth and rubble while the top was lined with three of four layers of brick. A carriage could ride along the top of the wall. A series of cannons were mounted along the wall to defend it. All this effort proved pointless in the end. The fall of the Ming dynasty to the Manchus who lived beyond the wall was fueled by internal strife as much by foreign assault from beyond the Great Wall. It was the rebellion led by Li Zicheng ➚ that sparked the demise of the dynasty. Li was born at Yan'an, Shaanxi (later to become Mao's wartime base) and rebelled against excessive taxes and oppression. His revolt soon gathered mass support at a time of hardship due to famine, he stormed the ancient capitals of Luoyang and Kaifeng. Li then declared himself leader of the new 'Shun dynasty 顺朝' at Xi'an in 1644. Meanwhile the Ming troops were deployed away in the north-west to hold off a possible Manchu invasion and were unable to prevent Li's revolt reaching Beijing. When Beijing fell, the Ming General Wu Sangui ➚ 吴三桂 fatefully formed an alliance with the Manchus to defeat Li and restore the Ming dynasty. With the Ming Emperor now dead, the Manchu troops took advantage and after defeating Li promptly installed themselves as the new dynasty. The Great Wall with all its impressive defenses, designed for just such an eventuality had played no part in the overthrow, the Manchu army had been let through the gates with open arms. With the extended northern area under Qing control, including Mongolia the Great Wall once again lost strategic value and was not maintained. It was only 400 years later, with the foundation of the People's Republic that the Wall came back into importance. Partly due to the great impression made by the Wall on foreign dignitaries it became a symbol of China's longevity, strength and historical achievement. Sections near to Beijing were then restored to 'pristine' condition while other sections have been left to rot and these form the 'rough wall' that can still be seen today. However in the heat of the Cultural Revolution during the attack on the 'four olds', the wall itself suffered, a section of the Wall at Gubeikou was dismantled to build PLA barracks, but this policy was swiftly reversed and this section rebuilt. Mao took the Great Wall as living proof that the Chinese could undertake massive construction projects and succeed. It was Mao who said ‘He who does not visit the Great Wall is not a real man; and he who does not love the Great Wall is not a hero’. Citation information for this page : Chinasage, 'The Great Wall of China', last updated 5 Dec 2016, Web, http://www.chinasage.info/greatwall.htm.